Ohio State students studying abroad might soon be able to save thousands of dollars as the OSU Board of Trustees looks to discuss a tuition waiver this week. The Board of Trustees is also set to discuss establishing the Brazil Gateway as a new university affiliate and the status of the “But for Ohio State” fundraising campaign at its meetings Thursday and Friday. Interim President Joseph Alutto is also set to present a “presidential transition update” during the governance committee meeting Friday. The Board’s finance committee is set to discuss a proposed tuition waiver for OSU students who enroll in university-approved third-party providers or direct enroll study abroad programs, which would allow the students to pay a $400 program fee instead of the full cost of tuition, according to the meeting schedule. If approved, the change would be effective for Fall Semester. 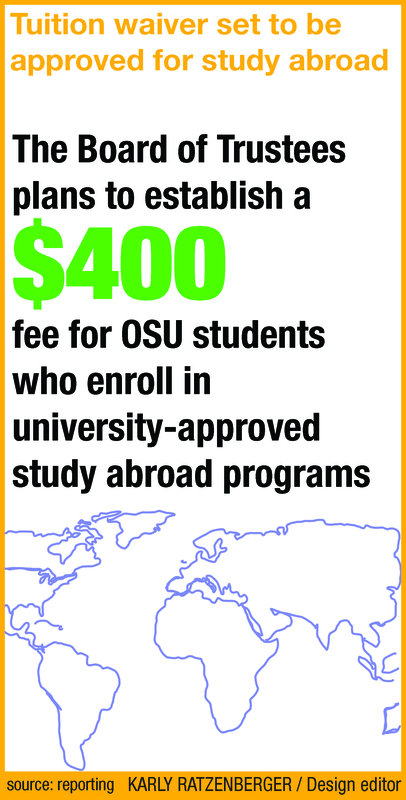 Students currently have to pay OSU tuition and tuition at their host institution while they study abroad. The $400 fee would be to cover services like risk management and administration. To receive approval for the waiver, the Board of Trustees must submit a waiver request to the Ohio Board of Regents. The establishment of the Brazil Gateway to facilitate OSU’s activities and operations in Brazil is set to be discussed at the audit and compliance committee meeting Thursday. The gateway offices “allow the university to forge new partnerships with a multitude of constituencies, recruit international students, aid curriculum development with international themes, implement dual degree programs, facilitate faculty research and reconnect with a growing international alumni base,” according to the schedule. Currently, OSU has gateway offices in Shanghai and Mumbai, India. The board is set to approve the gateway office to launch in São Paulo in early fall 2014 as a university affiliate, funded by the Office of Academic Affairs. The “But for Ohio State” campaign raised more than $1.72 billion through Feb. 28, but some areas of OSU are lagging in their fundraising. OSU started its “But for Ohio State” campaign, which aims to raise $2.5 billion by 2016, in 2012. According to a “campaign progress by unit” document, some areas of the university are behind schedule. Those areas include: the Fisher College of Business, OSU Wexner Medical Center James Comprehensive Cancer Center, College of Dentistry, College of Engineering, College of Food, Agricultural and Environmental Science; and the Wexner Medical Center. Sixty-three percent of the campaign donors have been “non-alumni,” according to the meeting schedule, with alumni making up 27 percent of the donations. 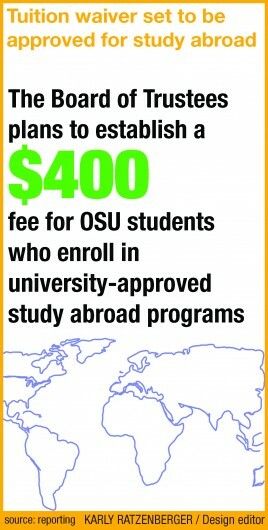 Does this mean OSU plans to increase the $500 fee international students have had to pay to help offset the losses? “Energy is the power that drives every human being. It is not lost by exertion by maintained by it.” by Germaine Greer.